Cathy Horyn is not sorry for what she wrote about Snooki. Nor does she feel particularly bad for Tommy Hilfiger, Alexander Wang, Giorgio Armani, or any of the other people whose collections and/or fashion sense she has publicly critiqued. Horyn, who is the New York Times' fashion critic, is profiled today by Jacob Bernstein at the Daily Beast. What does he unearth? Mainly that Horyn is an informed and passionate critic of the industry she covers. That isn't exactly news, but it remains a nearly unique distinction for Horyn in her field. Horyn has long taken perverse pride in informing readers when her reviews have resulted in retaliatory show bannings from such industry lights as Carolina Herrera, Giorgio Armani, Dolce & Gabbana, Helmut Lang, Nicole Miller, and Oscar de la Renta. "I don't think reviews really matter anymore," Herrera sniffed when Bernstein asked her what she thought about Horyn. Karl Lagerfeld claims not to read her. "Amy and I shared the same Midwestern quality, which is that we want people to be better," Horyn says. (Spindler died of cancer six years ago). "We have standards. We want people to be not just good but very good. And I can be tough on people, sometimes too tough, especially with the most creative. I once called one of Tom Ford's collections freakish and ugly." So that's why she said Alexander Wang is "not a great designer." (The review that line is lifted from is not uniformly negative. Horyn also calls Wang "clearly a shrewd guy" and praised him for making clothing that is affordable.) Indeed, among the major fashion critics — women like Lynn Yaeger, Sarah Mower, Suzy Menkes, and Robin Givhan — only Horyn and Yaeger consistently bring up price (and overprice) in their critiques. Horyn is also one of the few fashion writers to have made a point of saying that she does not find fashion bloggers in any way threatening. (Some of her peers have a conniption when asked to breathe the same air as a blogger.) Her contributions to the Times fashion blog are concise and entertaining, and she reads the comments, too. Horyn says of the flap over her Wang review, "With Alexander, he's a smart kid, I admire the business that he's built, but you have to be critical of what he's done. You can't just say, 'Oh well, he's young and he's working hard, he's putting a product on the runway.'" What do Horyn's critics think she should do? Give him a cookie? Horyn has stood up to Anna Wintour and American Vogue and pointed it out when Tommy Hilfiger's collection is even more boring and rip-off-y than usual. About the worst that can be said of Cathy Horyn is that one time she reported some objectively pretty terrible, and as far as anyone can tell accurate, things about a reality-television star who is proud to tell reporters that she has read only two books in her entire life, and that this arguably came off as "mean." Also, once she did not like a dress that Christina Hendricks wore. In any case, Horyn now says she was in the wrong on that one, to the extent that her critique (and her choice to report a quote from a stylist who said, "You don't put a big girl in a big dress") seemed like a criticism of Hendricks' body rather than the dress she chose to clothe it in. "I should have stepped back and explained what that person meant. It wasn't about Christina's figure," says Horyn. 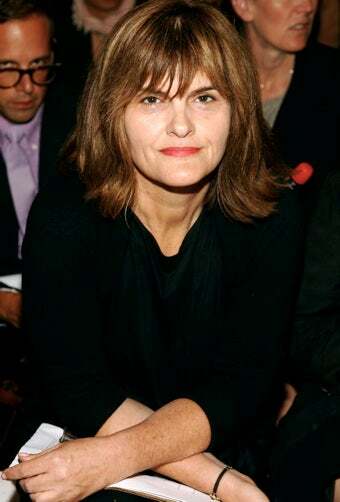 The thing is, if Cathy Horyn wrote about movies or restaurants or television — or almost anything besides fashion — her independent mind, depth of reportorial experience, and strong critical perspective would be considered an asset. We don't expect Roger Ebert to tell us that Remember Me was actually pretty good because Robert Pattinson and Emilie de Ravin are clearly talented and everyone involved must have worked really hard on it. We expect him to tell us the truth. With any other kind of consumer product, the critic is understood to be an ally of the reader — it is her job to be tough on the industry she covers so that the rest of us can perhaps avoid wasting our money on an inferior product. But most fashion writing is rightly understood by the reader to be a stooge for the luxury companies, and the writer a booster for their products. Seeing actual criticism of fashion therefore seems to some readers "personal" and "mean" in ways that criticism of industries more used to critique, like film and theater, does not. There are plenty of people in fashion who work hard — but, much as they may wish it were otherwise, none of them is above critical evaluation. Fashion is a hundred-billion-dollar global industry that specializes in separating (mainly) women from their hard-earned money. And the majority of its media suffer tremendously from their inability and/or unwillingness to enforce the church/state boundary common to every other arena of journalism. Cathy Horyn and writers like her are utterly necessary. Sarah Jessica Parker compares Horyn to Pauline Kael, and I can see her point; like Kael, she has a spine.